What is the greenBUG bag? 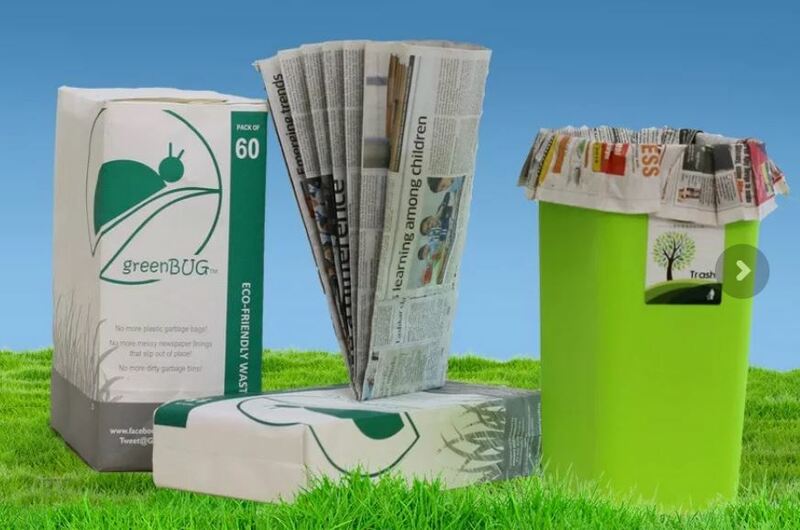 It’s an eco-friendly alternative to plastic garbage bin liners. It is the only one of its kind available that is affordable and responsible, both. Well, for one, it is made of recycled newspaper and natural glue, at no expense of electricity, water, fuels, or chemicals. It even handles moist kitchen waste well. Then, on disposal, it does not pose the grave danger that plastic does for thousands of years to the environment and to human health. So, its raw material is upcycled, its production process is energy- neutral and completely non-toxic, and, after it has served its purpose, it goes back into the environment entirely harmlessly! The greenBUG bag is produced by disadvantaged women, to whom this provides valuable supplemental income. We train them, provide them with productivity tools, buy up their entire production output, and find the market for it. They are paid upfront, thus insulating them effectively from market vicissitudes. You buy CONVENIENCE: Now, responsible waste disposal is convenient too! … UpCycling never got better! French drugmaker Sanofi has come under fire as Philippines has suspended the company’s Dengvaxia vaccine — the first promising vaccine for dengue— amid widespread fears about its safety and growing public anger over its use in 830,000 schoolchildren, reports The New York Times. Dengue is a disease spread by mosquitoes that infects about 400 million people worldwide. It puts 500,000 people in the hospital each year and kills 25,000, mostly in Latin America and South Asia. “The newly revealed evidence, confirmed recently by Sanofi’s review of study data, found that in rare cases, Dengvaxia can backfire: If people who never had dengue are vaccinated and later become infected, the vaccine may provoke a much more severe form of the illness,” the report says. The World Health Organisation (WHO) is reviewing the situation and has issued an interim recommendation that only people who have had a prior dengue infection be vaccinated. However, the issue is most people do not know if they have been infected or no. Dengue could be a serious disease with severe complications. However, in many cases there are no or mild symptoms. In addition, there is no ‘readymade’ test available to determine is someone was infected in the past and now can be vaccinated. The Philippines health secretary, Francisco T Duque III, had reportedly stated that the government is demanding a refund from Sanofi for the 3.5 billion Philippine pesos, or about $69 million, it spent on the vaccine. It is also asking the company to set up a fund to cover the treatment of any children who develop severe dengue. According to a report from the New York Times, the Philippines government has begun investigations into the rollout of the immunisation program by Sanofi, which allegedly discounted early warnings that its vaccine could put some people at heightened risk of a severe form of the disease. Death rates are highest among children, and just last week a 7-year-old girl who had not been vaccinated died from dengue in the Philippines, says the NYT report, quoting agencies. Dengvaxia, the world’s first dengue vaccine, had been developed by Sanofi over decades of research and is approved in 19 countries. Meanwhile, the Indian government is working on such vaccines and Phase 1 clinical trials of this vaccine is likely to be held in 2020. Minister of State for Health, Ashwini Kumar Choubey told the Rajya Sabha that DSV4, the vaccine developed by International Centre for Genetic Biotechnology (ICGEB)-Sun Pharma collaborative venture, is a recombinant vaccine on the Virus-Like Particles (VLP) platform with a tetravalent four-in-one VLP design; expressed in yeast, it elicits antibodies to all four DENV serotypes in a shorter schedule of 0, 1 and 2 months. The other experiment involves the Panacea Dengue Vaccine, which is a cell culture-derived live attenuated, recombinant, freeze- dried, lyophilized tetravalent vaccine with the seed strain borrowed from the US-based National Institute of Health (NIH) and the Drug Controller General India had granted permission to conduct clinical Phase I/II studies, the Minister said. Triggering public outrage, politicians in the Philippines are demanding information about Sanofi’s advertising campaign and their government’s aggressive push, against the advice of some experts, to vaccinate a million children. The backlash has alarmed researchers who worry that Sanofi’s stumble could stoke mistrust in vaccines around the globe. Hello. My name is Rajesh Mehar. I am a law-abiding citizen of India. Wait. Actually, I am not so sure anymore. Until 1 April of 2017, I was a good citizen. You could even have called me an Adarsh Citizen. I paid my taxes on time, did not participate in cash transactions if other alternatives were available, did not hoard cash or have undisclosed income, did not use unregistered mobile phone SIM cards, did not claim subsidies surreptitiously, and definitely did not resort to legal action against my own country. But since 1 April 2017, it has all been coming apart. I have not been able to file my Income Tax returns despite wanting and trying to. My bank accounts are most likely to become non-operational at the end of this month and I will be forced to transact only in cash. I will not be able to receive a salary, declare my income, or participate in the economy legally. My mobile phone connection will be blocked in February 2018, and I may need to borrow a SIM card and impersonate someone else. I still do not plan to claim any subsidies, but I most definitely plan legal action against my government. All of this has happened only because of one powerful force in my life. No, not my faadhaar, not my maadhaar, but Aadhaar. My name is Rajesh Mehar. I do not have Aadhaar and I am an orphan of our democracy. But why? What am I hiding? Several friends have laughed at my stubbornness. Why don’t you want to get Aadhaar? What are you hiding? Don’t you know Aadhaar is stopping many illegal practices? If you can give your fingerprints to the US Consulate for a visa, why can’t you give your biometrics to our government? Do you hate our Prime Minister? I have been thinking about these questions without scepticism and formulating my honest answers. It makes sense to start in reverse order. No, I do not hate our Prime Minister. I disagree with him on many counts, and I think he has made some grievous mistakes along the way, but I like him as much as I like any other political leader from any other party. And that is NOT why I have not got my Aadhaar. Yes, I have obtained a visa and travelled to other countries and I have submitted my fingerprints in the process. However, I did so feeling powerless, criminalised, and disenfranchised every moment of that process. I did so knowing that I would go back to the welcoming, safe bosom of my country at the end of the ordeal. Now to feel the same way about the land I was born in makes me sad beyond description. I feel like a crying child, beaten and abused outside, coming back home to discover that my parents had gone mad and I was to be beaten and abused at home too. No, Aadhaar has not stopped criminal activities and illegal practices, or even reduced them. In fact, criminals are using Aadhaar, and common citizens’ lack of understanding about it, to perpetrate crimes and continue illegal practices. The government themselves have leaked citizens’ private information, even the President’s office has. Sometimes, private information has been leaked through obscure websites that nobody knows about, like Zambo dot in. Using Aadhaar, common citizens’ money has been redirected without their knowledge, or cheated out of them again and again and again and again. In fact, criminals have even managed to make fake Aadhaars and the initial promise of weeding out fake claimants of government subsidies and entitlements is also now broken. But my friends are not idiots. “Arre, but it will never happen to you yaar. The government has made sure that there are safeguards. Even if anything goes wrong, you will be able to get redressal,” they say. Well, no. Aadhaar was created by a team of technologists who have since left Unique Identification Authority of India (UIDAI), the parent organisation, to create other companies that will profit from the Aadhaar ecosystem. This is a troubling conflict of interest, and at least one person connected to ‘monetising Aadhaar’ has been publicly outed as an online troll, creating multiple accounts to badger and discredit critics of Aadhaar. Some people who created the Aadhaar technology are acknowledged to be volunteers! Would I have my broken tap fixed by a volunteer plumber? Would I give my cellphone to have its shattered touch screen repaired by a volunteer technician? Then how can we accept that a mission critical national identity project was developed by volunteer technologists? If by chance, your or my Aadhaar number is made public, it can never be changed. And unfortunately, you and I are stuck with the same fingers and irises for the rest of our lives. Despite this irrevocable loss in case of a breach, there is no easy complaint system for Aadhaar-related fraud. You can call the Aadhaar customer service call centre, which, by the way, people are having trouble finding. Or it can be reached sometimes but the ‘system doesn’t work’. And of course, no court can allow any legal action connected with Aadhaar except if the legal action is initiated by UIDAI itself. So, if you or I have an Aadhaar related problem, what is the best way out? Many citizens have taken to using Twitter, a public social media platform owned by an American company, to get through to UIDAI. Moreover, UIDAI themselves encourage us to reveal our Aadhaar number by ‘Private Message’ to air our grievance via this website, which is legally bound to divulge information on the platform to American security agencies. Excellent. Nobody knows why Aadhaar is mandatory. Or even if it is mandatory. 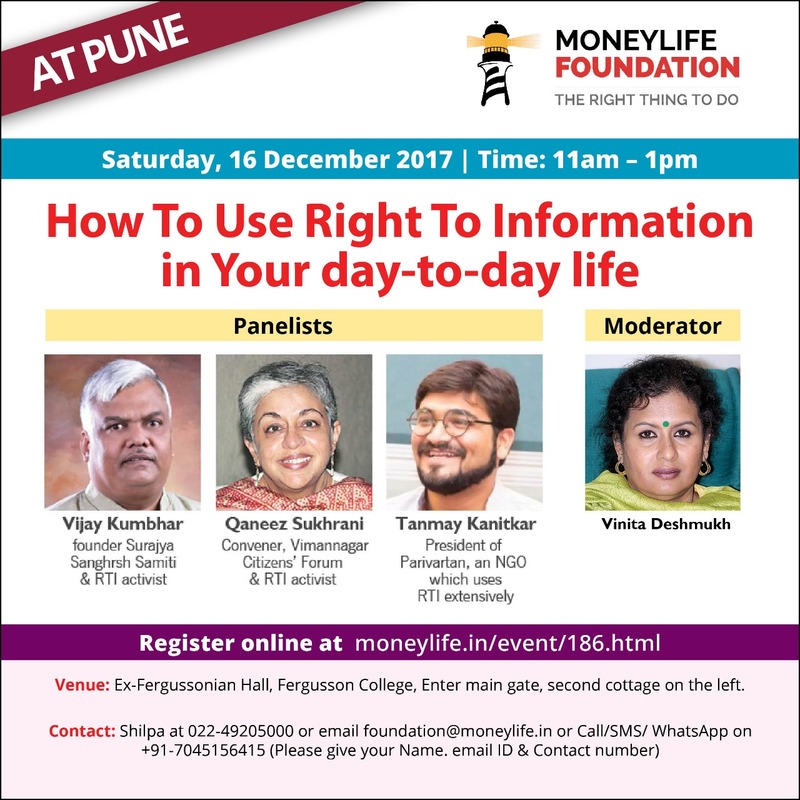 You can choose not to have an Aadhaar as long as you do not need a bank account, a mobile phone connection, income tax returns, school admissions, medical care, and a host of other optional items. Our Prime Minister himself had opposed Aadhaar vehemently. 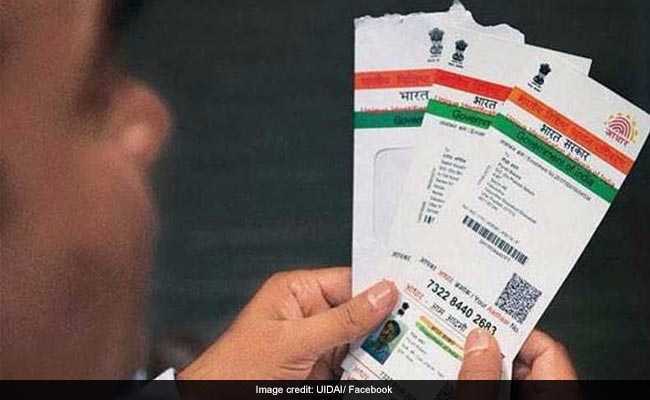 UIDAI itself petitioned the Supreme Court that Aadhaar should not be made mandatory. So, why is it mandatory? Nobody knows. Indian citizens are constitutionally blessed with three parents for support, one more than the average child gets allocated. These three parents are the legislature, the executive, and the judiciary. Citizenry have tried to tell these three parents that they are being abused. Unfortunately, these parents have orphaned us. The first parent, our legislature, passed the Aadhaar related legislation as a money bill, which means it did not get debated in the Rajya Sabha at all. The second parent, our executive, has been indirectly making Aadhaar mandatory by making it compulsory to link it to several other services. There is no option for those who do not have Aadhaar or those who do not want to link it. Our last resort, our judiciary, has been patiently wearing down our complaints by not substantially hearing the several Aadhaar related matters before it for the last two and a half years. So, bereft of any parental support, here I stand. Thank you for listening to my story. I am Rajesh Mehar, a law abiding citizen of India until the next Aadhaar linking deadline. I am now an orphan of our democracy. Will civil society adopt me?